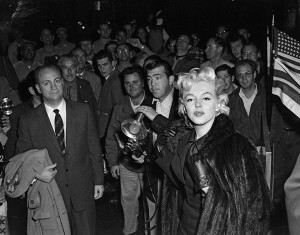 “Actress Marilyn Monroe flew into town last night and brought activities at International Airport to a standstill. As she stepped from an American Airlines flagship, hundreds of airport workers streamed out on the flight ramp to catch a glimpse of the glamorous film star. 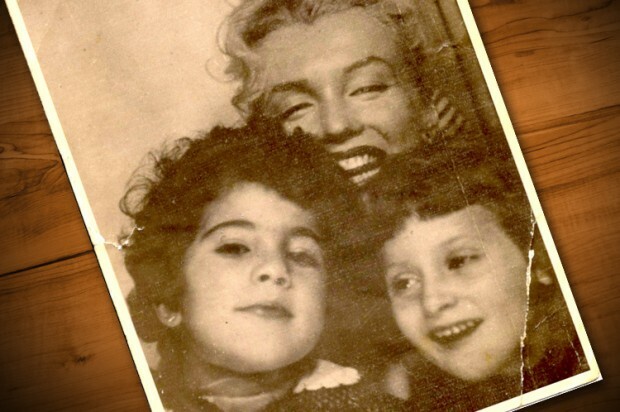 Dale Corvino‘s delightful reminiscence of Marilyn’s little-known connection to his mother’s family, the Rizzos – neighbours of the DiMaggios in San Francisco – is published in full at Salon today. The DiMaggios were also Sicilian; Guiseppe, the patriarch, had fished Mediterranean waters, and relocated to the Pacific coast in pursuit of a bigger catch. His haul out of San Francisco bay was bountiful, and he went on to raise nine children. To his initial disappointment, three of his sons turned their backs on the family trade to become baseball players. Joe was the real power slugger, having gone on to a record-breaking hitting streak with the Yankees. 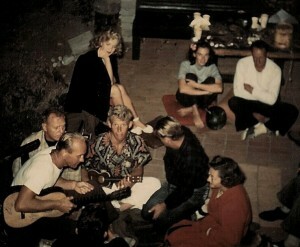 Around the time the DiMaggios befriended my grandparents, Joe began courting Marilyn Monroe. 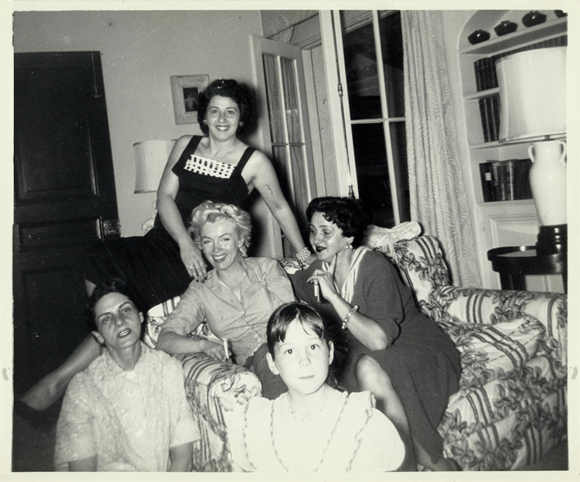 …My mother isn’t in either of those photos, but she was around that day with her cousin and playmate Laraine, and the presence of these two playful little girls warmed Marilyn’s heart; she longed for children of her own. She took to the girls instantly and showed them great affection. 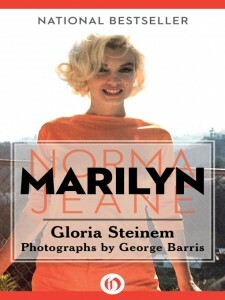 For today only, Gloria Steinem’s Marilyn: Norma Jeane is available at a reduced price of £1.29 as a Kindle Daily Deal on Amazon UK. “The story of Cypress Sea Cove begins in the 1940s with its original owner George “Cap” Watkins, a Bunyon-esque character who would eventually turn the place into his own private Shangri-La. 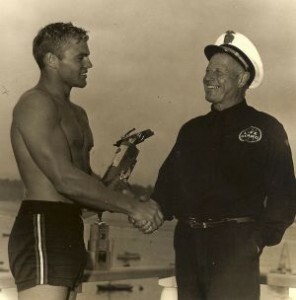 George ‘Cap’ Watkins presents Tommy Zahn with a paddle-boarding trophy. The article states that Marilyn was then the girlfriend of lifeguard Tommy Zahn. This would place her visits around 1946-7, during her first year as a Hollywood actress. Zahn was signed to Fox at around the same time – mainly because studio chief Darryl F Zanuck‘s daughter, Darrylin, had taken a shine to him. It was while working as a contract player that Tommy met the 20 year-old Marilyn. Anthony Summers interviewed Tommy Zahn for his 1985 biography, Goddess: The Secret Lives of Marilyn Monroe. This echoes other recollections of a young, sporty Marilyn. In later years, however, she was less confident in water. Zahn recalled that Marilyn was the most hard-working of all the young actors. They often worked together on dance, which they both found challenging. After talking to Zahn, Summers formed an interesting theory as to why Marilyn was dropped by the studio in 1947, which may also partly explain why – even after she became a star – Zanuck was never a strong supporter of MM. By the time Tommy Zahn died in 1991, he was a sporting hero, with a distinguished career behind him. You can read a recollection of his life by Craig Lockwood at EatonSurf.com. A biography of Zahn – including a chapter entitled ‘Hollywood & Marilyn’ – is downloadable from the Legendary Surfers website. Lawrence Schiller‘s ‘A Splash of Marilyn’ exhibition – featuring photos from Marilyn’s last, unfinished movie, Something’s Got to Give – is coming to Berlin’s Galerie Mellili Mancinet on October 4th, through to November 9th. 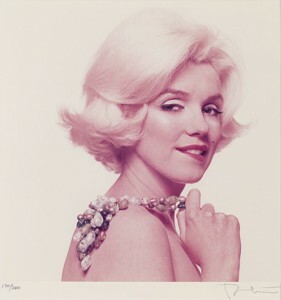 Last year, it was reported that files related to Emmeline Sniveley’s Blue Book agency – where Marilyn made her name as a model – had been recovered in Holland. On her blog today, Michelle Morgan (author of Marilyn Monroe: Private and Undisclosed) announced that she is working on a book and documentary with Astrid Franse, owner of the archive. With a working title of Marilyn’s Blue Book Days, this exciting project also has a Facebook page. A special portfolio featuring photos of Marilyn, taken by Bert Stern (who died in June) was sold for $41,250 this week ($33,000 plus costs) by Freeman’s Auctioneers – at almost four times the original estimate, reports CBS News. 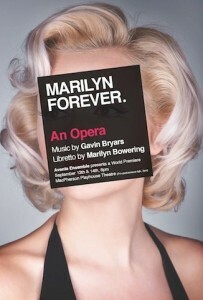 Marilyn Forever, an opera, will be staged this weekend at the McPherson Playhouse in Victoria, British Columbia, reports the Times-Colonist. Starring the Faroese singer, Eivor Palsdottir, it features a libretto by poet Marilyn Bowering, based on her 1987 book, Anyone Can See I Love You, set to music by the British composer, Gavin Bryars. An earlier version of the show was produced in 2010. “Pálsdóttir, chatting between rehearsals, said Marilyn Forever commences unconventionally with the movie star’s death. ‘She’s lying dead in her bed and she kind of wakes up. And her thoughts go back,’ the 30-year-old said. She worked with Bryars five years ago, performing a piece called Tróndur i Gotu. In Marilyn Forever, aside from a couple of sequences, she makes no attempt to replicate Monroe’s breathy delivery. Pálsdóttir deliberately sings in her own voice, which at times sounds ethereal — somewhat reminiscent of Björk and Kate Bush. ‘My biggest challenge is probably [Monroe’s] body language. And the link between not trying to sound like her, but still being her. That’s quite a challenge, actually. It’s Marilyn with a different voice,’ she said. Bryars…recalls obsessively watching her 1961 film The Misfits for an entire week. Back then, British cinema-goers typically saw two films in a row — an ‘A’ and ‘B’ feature. Bryars would watch The Misfits, read the movie’s script while the second feature played, then watch The Misfits once more. ‘There was a sense it was the end of a whole group. And the film itself was about the end of a world, this world of rounding up horses and so forth, this whole neo-cowboy world,’ Bryars said. Most of all, there was that intangible something about Marilyn Monroe. Bryars’ interest was rekindled when he read Bowering’s 1987 book of poems about Monroe, Anyone Can See I Love You. Bowering also created a stage and a radio version — the latter was broadcast by the CBC and the BBC. Designer Prabal Gurung, whose latest collection has been unveiled at New York Fashion Week, was inspired by Bert Stern’s photographs to create a ‘futuristic Marilyn’, according to AFP. However, it must be acknowledged that Gurung has created something new from what went before, rather than merely reproducing the past. Gurung’s dresses and skirts fell mid-calf, some elegantly off-shoulder, in pastel pink, lavender, canary yellow, green or bold prints. Lips were bright pink and tangerine while hair was slicked back. Describing his collection as ‘femininity with a bite’ the designer — who launched his eponymous brand in 2009 — said he pushed into the future using unusual fabric choices. 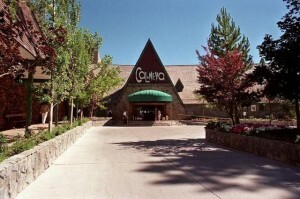 Plans are afoot to renovate the Cal-Neva Lodge at Lake Tahoe – where Marilyn partied with Frank Sinatra and his Rat Pack buddies in the early 1960s – reports the Reno Gazette-Journal.